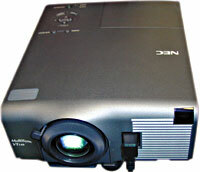 If color projection quality is paramount, take the NEC MultiSync VT540 along. Most digital light projectors and older LCD projectors emphasize brightness, but the VT540 instead concentrates on color fidelity. The downside is that the screen is less bright than on other DLPs I have tested. The VT540 generates only about 500 lux at nine feet, far below the raw power level of 900-lux and stronger projectors. The VT540 shines in a different area. It uses a technology called Vortex to enhance image quality beyond that of a standard DLP. The VT540's cooling system keeps the focusing knob from becoming too hot to handle. The software that controls the projector looks first at white uniformity to prevent drop-off at the screen edges. Second, it corrects for so-called gamma detail. From what I have seen, this is largely responsible for the high image quality. The response curves of LCD and DLP projectors are different, and NEC has optimized the display so that an image you see on a high-end CRT monitor looks almost exactly the same on the large screen after being projected. The third thing the software checks is blackness level, which improves the lower end of the color range, especially grayscale. Finally, the software separates colors and concentrates on correcting flesh tones, which LCD projectors often wash out. The result is a nice screen image at moderate light levels. In bright rooms, detail is lost, but in dimly lit or totally dark environments, the output is impressive. It's worth noting that you can't compensate for an overly bright room by boosting the brightness of the projector. Raising the brightness washes out the image, eliminating most of the advantages gained by the Vortex corrections. So the VT540 is best used in a theaterlike environment or one with dim lighting. For use elsewhere, a projector with more raw optical power and less color accuracy would be a better pick. A four-tunnel manifold that vents heat out the bottom front, under the lens, keeps the 5.8-pound unit cool. Such positioning would generally be a disadvantage in focusing a projector, but the VT540's vent does not heat the plastic focus knob that's around the lens. The rest of the unit remained surprisingly cool even when powered for long periods'a tribute to the efficiency of the heat venting system. I've found that good heat venting generally means longer bulb life. During my tests, I lost no bulbs to burnout. The controls are easy to use. The VT540 turns on and off when you press and hold down a single button. It takes about a minute to cool down when powered off. I did sometimes have a bit of trouble getting the unit to turn on until I learned to hold down the button for several seconds. The wireless remote, the size of a credit card and about twice as thick, can raise and lower speaker volume or put a pointer on the big screen. The software-based pointer defaults to a little cartoon hand, moved via four directional buttons. It sometimes would not move when I was not directly facing the projector. The VT540 has a decent sound system. Although it has only one speaker that faces the rear of the projector, it's adequately loud for most purposes and slightly better than most notebook PC speakers. But the speaker is not good enough for advanced multimedia presentations that rely on high-quality sound. the speakers made the units too heavy to carry. In the ultraportable world, the VT540 is about the best you can do. The attached handle makes carrying the VT540 a breeze, even without a proper case. But if you end up in a bright room with no shades, your presentation is going to be a bit anemic. If you can dim the room lights, the accuracy of the VT540's image reproduction is difficult to beat.